When I was at University the mother of a very good friend of mine came to visit and we ended up talking about a book we were reading called an Intelligent Woman’s Guide to Socialism and Capitalism by Bernard Shaw. She later sent this (much more slender) book to me with a note suggesting that rather than plowing through the weighty Shaw, I might prefer this read. As the Intelligent Woman’s Guide is on my reading list for this year, you can tell that I took her advice. The aim of me reviewing this book today is not, actually, to tell you to be a socialist. Instead, I would just urge you to go and vote. Whoever you vote for, go and make your mark, have your say and make our democracy strong. So many of the books I have been reading this year, like Pandora’s Breeches, are from a time when many people (men and women) weren’t able to vote. Without a vote they had no voice in how the country ran itself, they couldn’t influence the laws that governed their lives and their opportunities were constrained because of it. Still today the government has so much influence over our lives that it is simply wrong not to vote for whoever you think best represents your views. So please, please go and vote. In fact, stop reading this blog right now and vote. Unless, of course, you’ve already voted in which case: gold stars for you. Have a cup of tea and biscuit and enjoy the rest of the day with that post voting glow. Published in 1944 this book is a persuasive piece of writing designed to highlight the inequalities of the economic system in the UK and to convince people that socialism is the solution. We have fought this war to preserve our freedom: what are we going to do with it? What a brilliant opening line! And the start of a great polemic about how it is the ordinary people who have devoted their lives to the war and so the ordinary people who should be able to decide what happens next. The book essentially argues that at the moment wealth is gathered in the hands of a small elite who grow wealthy while the vast majority live in a state of poverty. It then goes on to paint a beautiful picture of the possibilities available if we a got everyone working in meaningful work and spread the wealth more evenly across the nation. There is an interesting discussion of wages and how they are set in line with the price of labour rather than the value that the person brings to the company. This is stated in a way that suggests it was a fairly novel idea at the time. But the book does rather elegantly raise the question of what the people at the top, who own the organisations, actually do for their money. There is a suggestion that whatever they do in their offices all day doesn’t somehow count as ‘real work’. It does, interestingly, though assume that women will go back to their families and leave the workforce after the war – that isn’t even an assumption it questions at all. After painting a fairly grim picture of the present situation the book, it goes on to warn of the dangers of a resurgence of Nazism if changes aren’t made. This leads us neatly into part 2. The book makes extensive efforts to make clear that the version of socialism they are advocating is not one where nobody owns any property, but rather one where wealth is spread more equally, so more people own more property. They will achieve this by nationalising the means of production. It then goes on to propose a new mechanism for calculating wages, in which more skilled workers will still be paid more than the less skilled, but in which the real exploitation of the less skilled is ended. Unfortunately he then goes on to hold up Soviet Russia as a shining example of all of this working in practice, which just goes to show that the world was much smaller when this book was written. The book then goes on to suggest how to get to the new state which is, apparently, through the democratic process rather than violent upheaval. But to be effective people must refuse to elect MPs from the economic elite. Fortunately, the Labour movement has now grown to the point that it is ready to take the country forward. It isn’t good enough to just read about socialism, or even to advocate it in theory. The real thing to do is to identify yourself one way or another, with the hard, practical work of the Labour movement in improving the conditions of life of the British people. 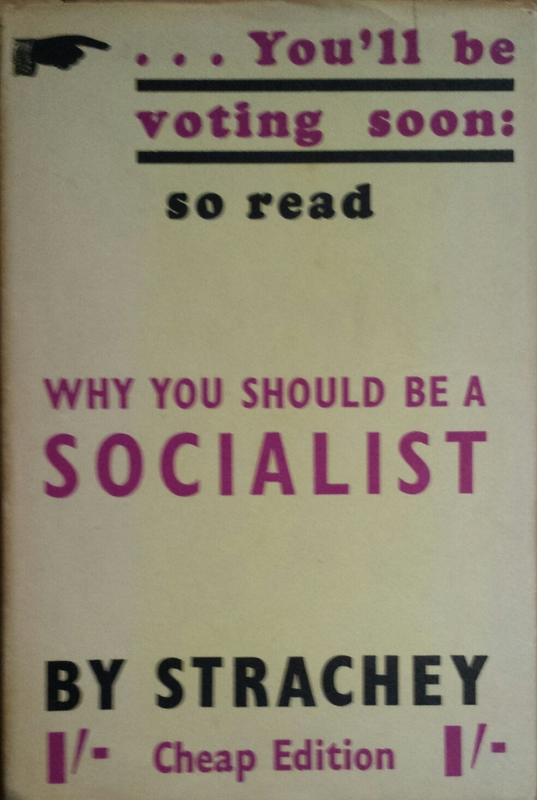 Tags: book, book review, books, election, labour, socialism, socialist, vote, voting. Bookmark the permalink.